Today we were beach bums. We slept in, 7:45 am for me (my sleep schedule has been off so don't judge me) and 9:45 am for him. We've both been wanting to go to the beach for a while and today we made it happen. 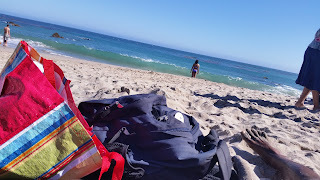 We went to Leo Carrillo beach in Malibu. We love this beach. Although this was only our second time going to this beach, it's going to be hard to get us to go to any other beach. The first time we visited Leo Carrillo was a couple years ago with a group of a friends from our church for a camping trip. We had a great time there, it was very relaxing. It was our first time camping with tents and sleeping bags out in nature and so close to the beach and we enjoyed ourselves. I think the beach by far was the highlight of that trip. Leo Carrillo is not like the other beaches in the area, where it can get pretty crowded. 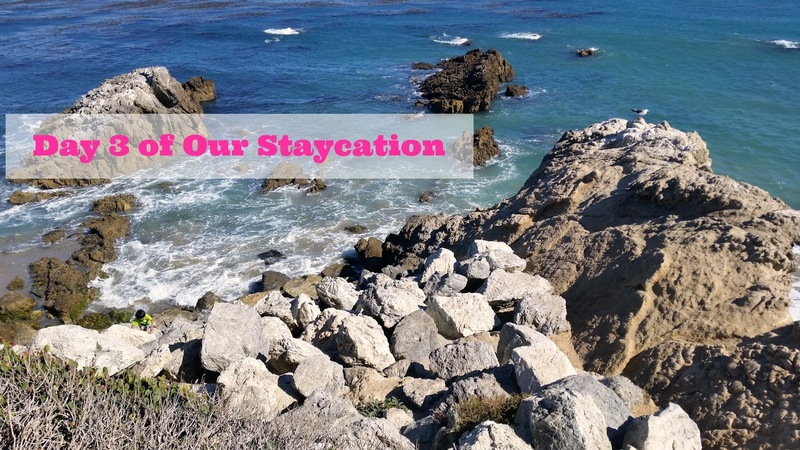 Leo Carrillo is peaceful and laid back. There are tide pools close to shore with Mussels. As well as tons of huge cliffs you can climb to get a better view of the coastline. And the best part is that it's quiet and not crowded. The first time we went we both fell asleep on the beach. It was so nice and refreshing. Granted we've only been on weekdays so not sure if it has the same vibe on a weekend or holiday. I'd like to think so as not to ruin my perception. As I played in the water my hubby took pictures of me like the paparazzi. (That's me on the right) The water was absolutely freezing but after awhile I got used to it. I felt like a kid again, running through those waves and giggling uncontrollably. It was a game of tag and I wasn't it. I was doing my best not to get tagged by the waves. Jumping and hopping over each wave as it crashed on the sand. The waves surrounded me on each side. Overtaking me at times. Only once was I caught off guard but in my defense my back was to the water. 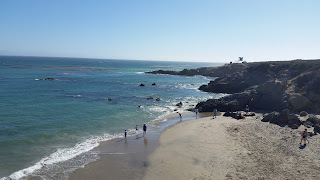 After the water became unbearably cold I went back to our spot on the sand and dried off while my hubby climbed the rocks to get a better view of the beach and take more photos. Then I became his paparazzi. (That's him on the left on top of the rocks.) Today was such a beautiful day. The sky was so blue and the water a teal green. The sand was powdery as if it had been finely sifted. The air was thick and moist and the sun hung high. There was a cool breeze that moved my hair perfectly as my husband snapped pictures. All in all it was a great day. We both needed a recharge and these few days have been just that. For me it's been a bigger reminder to make time to rest. I work and I play hard but I don't really rest as much as I should. Resting is so important. Taking time to regain focus and set a priority and remove unnecessary stress mentally. Rest does that for me. It reminds me what's important in life so when I'm in the fire I can remember my values, I can take my time to respond, be present and walk in purpose. Okay that was really random and deep. I guess just something to chew on for the moment. I know I skipped a day detailing our Staycation. I may write a blog post on it later. Well I hope you enjoyed this post, leave me a comment below with your favorite spot by the water. I'd love to hear from you and as always thanks for reading!